We don't travel as much as I'd like to we used to. But all of our trans-Atlantic fights over the years have taught us a thing or two about dealing with luggage. That little gadget pictured above is a lifesaver. Well, maybe not a lifesaver, but definitely a money saver. 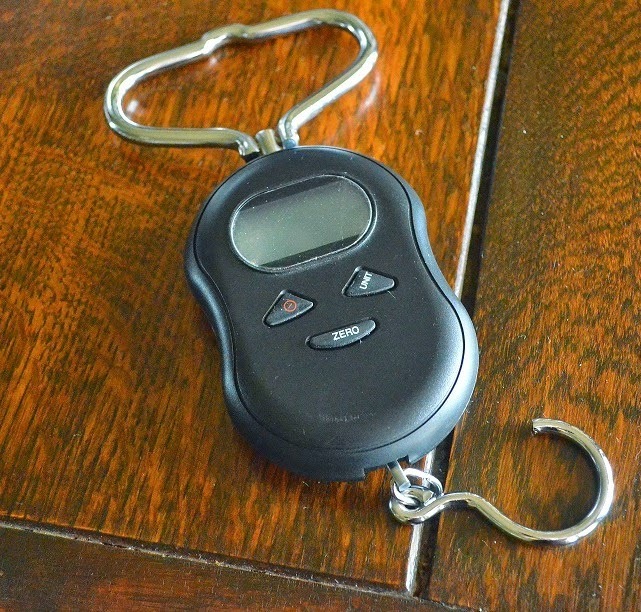 It is a handheld scale to let you know exactly how much your suitcases weigh. Once upon a time, I could shove as much stuff as possible in my suitcases and the airlines would just put a tag on them saying they were heavy bags. Oh, those were the days. Then they started putting more and more restrictions on the size and weight of luggage. Currently, most airlines will let you check one bag that weighs 50lbs. or less. Are you kidding me airlines? My shoe bag can weigh that much! The little gizmo fits into your suitcase so you can take it with you. Why do I care about knowing how much my suitcase weighs? Well, on our recent flight, the airline would have charged us an additional $100 per bag that was over the weight limit. If I know how much the bags weigh, I can shuffle stuff around to make sure the weight is more evenly distributed. Engineer would just tell me to take fewer pairs of shoes, but that's a ridiculous suggestion. That is awesome! I've never heard of such a gadget! It is awesome Ms. Becky! It has to be on the must have list for frequent flyers. That is super useful! We had to pay extra to take an overweight bag once. It wasn't fun. That is the last thing you want to deal with isn't it Ms. Brenda, being stung with a charge when you are to-ing and fro-ing. GENIUS! We travel quite a bit, and always pack carry-on only. But I'm pinning this smart tool for those who don't! Thanks for sharing! Neat!! I had never heard of this before.